The Newport was a name used by Chrysler for both a hardtop body designation and also for its lowest priced model between 1961 and 1981. Chrysler first used the Newport name on a 1940 show car, of which five vehicles were produced. 324 cu in (5.3 L) L-head Straight-8, "Chrysler Spitfire"
The Newport Phaeton served as the pace car for the 1941 Indianapolis 500 race. This pace car, chassis number C7807503, was the only one that did not have hide-away headlights and became the personal property of Walter P. Chrysler Jr. after the race. Photos of the car can be found here. The redesigned 1949 Town and Country was first proposed as a hardtop, however the body style only appeared in the model's final year in 1950. In 1961, the Newport was available as a two-door convertible, two-door hardtop, four-door sedan, four-door hardtop and four-door station wagon. The base engine for the Newport was the 361 cu in (5.9 L) V8 engine rated at 265 hp (198 kW; 269 PS). Optional was the 413 cu in (6.8 L) and the 383 cu in (6.3 L) that was mostly used in the Town and Country station wagons. All Newports could have been ordered with the 413 either single or dual four-bbl carbs and most of the 300 letter car options, except the four bucket seats, center console, and tachometer. Station wagons from 1961 through 1964 featured hardtop body styling, with no "B" pillar. The canted headlight approach was previously used by Lincoln, and briefly by Buick, but by 1961 when this generation was introduced the feature was unique to Chrysler. The 1962 model year Chryslers continued to use the 1961 body, but were shorn of their tailfins. The 1963 model year was a major restyle without any tail fins. The 1964s saw the return of small, chrome-topped fins. The 1965s Newport was built on an all-new Chrysler C platform, shared with the 300 and New Yorker, along with the Dodge Polara and Plymouth Fury. Styling mimicked the square lines of the Lincoln Continental and the 1964 Imperial, while wheelbases increased 2 in (51 mm) to 124 in (3,150 mm) (wagons continued on the 122 in (3,099 mm) wheelbase). All body styles were continued from 1964 including the pillared four-door sedan, four-door hardtop sedan, two-door hardtop coupe, and convertible, along with the station wagon, which was renamed the Chrysler Town and Country and became a separate series. A new bodystyle for 1965 (shared with other Chryslers and Dodge Polaras) was a six-window Town Sedan that included a small side-window in the pillar similar to the three-window design of 1950s cars. This design would later return in the 1970s. The standard engine for the 1965 Newport was the 383 cu in (6.3 L) V8 with two-barrel carburetor and 270 hp (201 kW; 274 PS), designed for use of regular gasoline of 92–94 Research octane. Optionally available at extra cost was the 383 with four-barrel carburetion and 315 hp (235 kW; 319 PS) with higher compression and required premium fuel of 98–100 octane rating. The standard transmission was a three-speed column shifted manual and optionally available was the three-speed Torqueflite automatic transmission, now featuring a column-mounted shifter replacing the pushbuttons of previous years as was changeover on all 1965 model year Chrysler Corporation cars and trucks. Interiors featured padded instrument panels, full carpeting and choices of cloth-and-vinyl or all-vinyl bench seats and notchback bench seats with armrest. Newport coupes and convertibles were also offered with optional bucket seats with either a center console and floor shifter or armrest and center cushion. The 1966 Newport received new grille work and revised taillights, but was otherwise changed very little from 1965. Engine offerings were revised with the 270 hp (201 kW; 274 PS) 383 cu in (6.3 L) two-barrel continuing as standard equipment while the four-barrel 383 received a 10 hp (7 kW; 10 PS) increase to 325 hp (242 kW; 330 PS). New this year was Chrysler's 440 cu in (7.2 L) V8 that was available in a high-output TNT version with four-barrel carburetor, dual exhausts, and dual-snorkel air cleaner. This version was rated at 365 hp (272 kW; 370 PS), about 15 hp (11 kW; 15 PS) more than the standard 440 four-barrel that was the base engine in the New Yorker and Imperial, and optional on the Chrysler 300 as well as Dodge Polaras and Monacos, and Plymouth Furys. For 1967, the Newport and other Chryslers received new sheet metal, but retained the basic 1965 bodyshell. Two-door hardtops received a new angular semi-fastback roofline featuring reverse-slant side windows while the rooflines of four-door pillared and hardtop sedans, and station wagons were unchanged. The slow-selling six-window Town Sedan was dropped this year. Engines were unchanged except for the 440 cu in (7.2 L) TNT version was increased up to 375 hp (280 kW; 380 PS). New to the Newport line for 1967 was a more luxurious Newport Custom series available in four-door pillared and hardtop sedans, along with the two-door hardtop. The 1968 Newport received only a minor facelift from its 1967 counterpart including new grilles and taillights. All body styles were carried over on both the base Newport and Newport Custom lines. The standard 383 cu in (6.3 L) two-barrel V8 received a 20 hp (15 kW; 20 PS) increase to 290 hp (216 kW; 294 PS), while the four-barrel 383 cu in (6.3 L) rating went from 325 hp (242 kW; 330 PS) to 330 hp (246 kW; 335 PS), while the 440 cu in (7.2 L) TNT was unchanged at 375 hp (280 kW; 380 PS). A mid-year offering on the Newport hardtop coupe and convertible was the Sportsgrain option similar to the simulated woodgrain exterior bodyside trim on the Town and Country station wagons of this period. The Sportsgrain Newport was intended to bring back the spirit of the late 1940s Town and Country convertibles but amounted to little more than a regular Newport as there were no other modifications and interior trims were the same as standard Newports. Production of the 1968 Sportsgrain Newports amounted to 965 hardtops and 175 convertibles. The Sportsgrain option returned for the redesigned 1969 Newport two-door hardtop and convertible; however, orders for the option were low that Chrysler did not release their production totals. Mercury tried a similar approach to the Sportsgrain Newport in 1968 by offering woodgrain "Yacht Deck Paneling" as an option on its Park Lane coupes and convertibles, which also did not experience significant consumer demand. The Newport was completely redesigned again for 1969, and featured the distinctive "Fuselage Styling" that would become symbolic of Chrysler's full-size cars until the end of the 1973 model year. Although retaining the same 124 in (3,150 mm) wheelbase that it shared with the premium New Yorker, this generation Newport was longer, lower, wider, and several hundred pounds heavier than the 1965–1968 Newports. Although still offered in 2-door and 4-door hardtop, 2-door convertible, and 4-door sedan models, station wagons were no longer part of the Newport series, as the Town & Country became a separate model outright. Newport convertibles were discontinued after 1970, following a drop in sales of 48% that year, to 1,124 convertibles; while total Newport sales were down almost 30%, to 110,292 units, despite the restyling. Available in 2- and 4-door hardtops and 4-door sedans, the Newport Custom would still be offered as the top-line Newport through the entire 1969–1973 design cycle. First appearing in 1971, the Newport Royal was an entry-level model in the Newport Series. It borrowed the name of the entry-level Chrysler from 1937–50; but the Royal name was dropped in 1972. For the 1971 model year, the Royal came standard with the 255 hp (190 kW; 259 PS) 360 cu in (5.9 L) V8, with optional 275 hp (205 kW; 279 PS) or 300 hp (224 kW; 304 PS) 383 cu in (6.3 L) engines, but not the 440 cu in (7.2 L); the Custom was standard with the 275 hp (205 kW; 279 PS) 383 cu in (6.3 L) V8, and the 300 hp (224 kW; 304 PS) 383 cu in (6.3 L) or 335 hp (250 kW; 340 PS) 440 cu in (7.2 L) V8s as options. For 1972, the Royal came standard with the 175 hp (130 kW; 177 PS) 360 cu in (5.9 L) V8, with larger-displacement engines unavailable, while the Custom was standard with the 190 hp (142 kW; 193 PS) 400 cu in (6.6 L) V8, and the 225 hp (168 kW; 228 PS) single- and 245 hp (183 kW; 248 PS) dual-exhaust 440 cu in (7.2 L) V8s were optional. Power output would steadily decrease on all engines during this generation due to stricter emissions standards and rising fuel prices. The Newport was redesigned for the 1974 model year, along with all other full-size C-body cars. This generation shed the sweeping "fuselage" styling, in favor of more crisper, slab-sided styling. Despite losing several inches in length, 1974–1978 Newports were some of the heaviest cars ever produced by Chrysler. Their introduction coincided with the 1973 OPEC oil embargo, and sales of all full-size cars plummeted. The Chrysler Corporation was especially hit hard, as no smaller cars were sold under the Chrysler brand. Production of the C-body Newport ended in 1978, along with the Chrysler New Yorker. Related Dodge and Plymouth C-body cars, as well as C-body Chrysler Town & Country station wagons had all been dropped the previous year. The 1978 Newport and New Yorker offered the American car industry's last true two-door and four-door hardtops; all four-doors and Newport coupes were hardtops, the pillared sedan also having been dropped. The 1979 model year saw a new downsized Newport on the Chrysler R platform, a derivative of the circa 1962 Chrysler B platform. This reduced model availability to a single "pillared hardtop" 4-door sedan. While GM and Ford had downsized their big cars by engineering smaller bodies around more spacious passenger accommodations, Chrysler took a different approach. The existing Chrysler B platform was modified to improve fuel efficiency through a number of weight saving measures. Examples include plastic brake wheel cylinder pistons, which tended to swell and bind up the brakes after a some years in service. Chrome-plated aluminum bumpers were another innovation, but were replaced in 1980 with a stronger steel rear bumper. The large displacement V8 engines were dropped. Initial 1979 sales were strong (with a large portion of Newport sales going for fleet use), but Chrysler's unsteady financial condition, combined with the 1980 addition of the Plymouth Gran Fury, tightening oil and gasoline supplies hurt sales of the redesigned vehicle, and all of the R-body models were discontinued after a short run of 1981 models, as Chrysler began its shift toward smaller front-wheel drive cars. 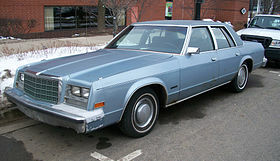 The Newport model name nearly made a comeback in early 1984 as an addition to the M-Body (Dodge Diplomat, Plymouth Gran Fury, Chrysler Fifth Avenue) lines. Orders were taken by Chrysler-Plymouth dealers, but at the last minute, the would-be Newport was marketed as the Dodge Diplomat SE. This model used the same waterfall grille as the Chrysler Fifth Avenue with the exception of a horizontal bar running across the center to mimic the other "crosshair" grilles in the Dodge lineup. ^ "Le Baron – LeBaron Carrossiers". Coachbuilt.com. Retrieved 15 February 2014. ^ a b "1941 Chrysler Newport Concept Images, Information and History". Conceptcarz.com. Retrieved 15 February 2014. ^ "1951 Chrysler Brochure". Oldcarbrochures.com. p. 16. Retrieved 15 February 2014. ^ Flory, J. Kelly (2008). American Cars, 1946–1959: Every Model, Year by Year. McFarland. p. 262. ISBN 9780786452309. ^ "Windsor Newport – 1950 Chrysler Brochure". Oldcarbrochures.com. p. 13. Retrieved 15 February 2014. ^ "New Yorker Newport – 1950 Chrysler Brochure," p. 5. ^ "Town and Country – 1950 Chrysler Brochure," p. 8. ^ Flory 2008, p. 330. ^ "1961 Chrysler New Yorker Technical Specifications and data". Conceptcarz.com. Retrieved 15 February 2014. ^ a b c d The Encyclopedia of American Cars, 2006 Edition, p. 250-276: "Chrysler." ^ a b c Flory, p. 890. ^ Flory Jr., J. Kelly (2012). American Cars, 1973-1980: Every Model, Year by Year. McFarland. p. 586. ISBN 9780786443529. Retrieved 6 February 2018. Wikimedia Commons has media related to Chrysler Newport. This page was last edited on 14 March 2019, at 19:25 (UTC).